Relay Timer R16X is a programmable timer software to control relays according to a time schedule. The software can be installed on a computer or server and will get it's time from there. For applications where the time schedule must match the computer's time this is a perfect choice. Shift changes, school bells and such can match a time clock installed on the same computer. Relay Timer Software is compatible with any of the ProXR and ProXR Lite boards. You can use any interface offered, Relay Timer will communicate with any of the Wired, Wireless or Network interfaces. Relay Timer gets it time from the computer's clock so the time will be accurate and will not drift. If you have another application running on the same computer the time will match exactly, such as a time clock. The software the high resolution timer that the same timer used in multimedia applications which can get resolution of 5 to 10 milliseconds. That makes a big difference for real time applications and accuracy. As an application that controls hardware, it has to be reliable. There are many factors effect reliability, the connection could be broken, power failure, the computer could crash. It is easy to create software that run perfect under perfect conditions. However, real world conditions is what Relay Timer was developed to handle. The software has to have a way to handle abnormal conditions and return to normal operation when the problem has been resolved with little effort. Relay Timer does this! If there is a power failure, lost connection or board doesn’t respond, Relay Timer will report the error on the interface and continue to update the status of relays. Users will know the software cannot communicate with the board and can troubleshoot the issue. When connection is reestablished Relay Timer updates the relay status both when there is change in status, and at the specific time interval. The interval is generally set to 2 to 5 seconds, which means, if there is a power failure, or lost connection, the status of relay will be recovered in seconds. Relay Timer determines where in the schedule it is and what the status of the relay should be bringing you back to normal operation within of seconds. 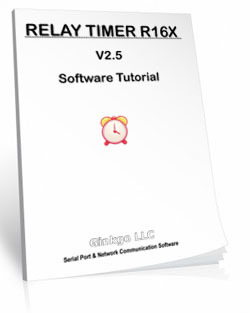 Below is the Software Tutorial for the Relay Timer R16X.